First prepare the black sticky rice as per our detailed instructions. Place 1.5 cups cooked black sticky rice in a saucepan and add 1.5 cups water. Bring to a boil and cook for 12 minutes (or a bit more if you want the rice to be extra-soft). While the rice is cooking, in a separate bowl mix the tapioca starch with a small amount of water and stir to make a paste. Also open the can of coconut milk and mix it well with a spoon. 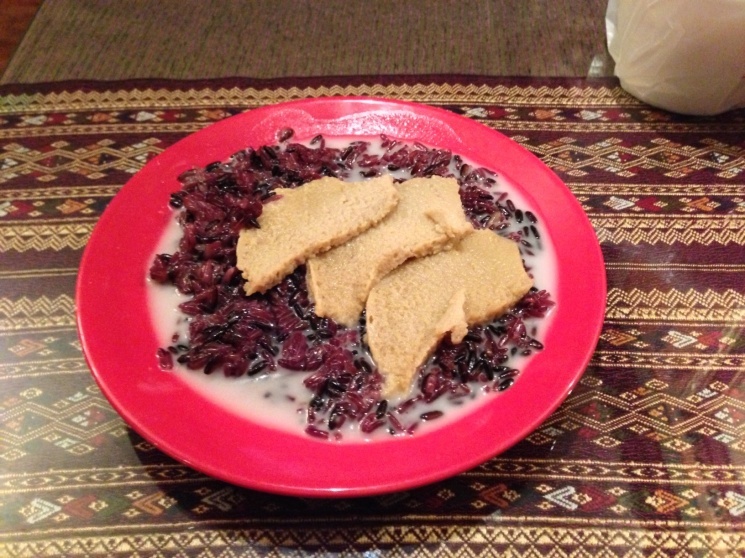 After the rice has cooked 12 minutes, add the tapioca. Stir well and remove from heat. Add sugar, salt, and continue to stir. Spoon the rice into two or three serving bowls (try to use somewhat flat bowls rather than deep ones). Spoon a thin layer of coconut milk over the rice, just enough to cover it, and garnish with a sprinkle of toasted sesame seeds and a sprig of fresh mint. Serve nice and hot, and let the person eating it mix together the rice and coconut milk. Enjoy--this is one very delicious dessert! We also have a recipe for sweet sticky rice with mango.